In 2012, DOX put on a large retrospective exhibition of the work of leading Czech sculptor Karel Nepraš. 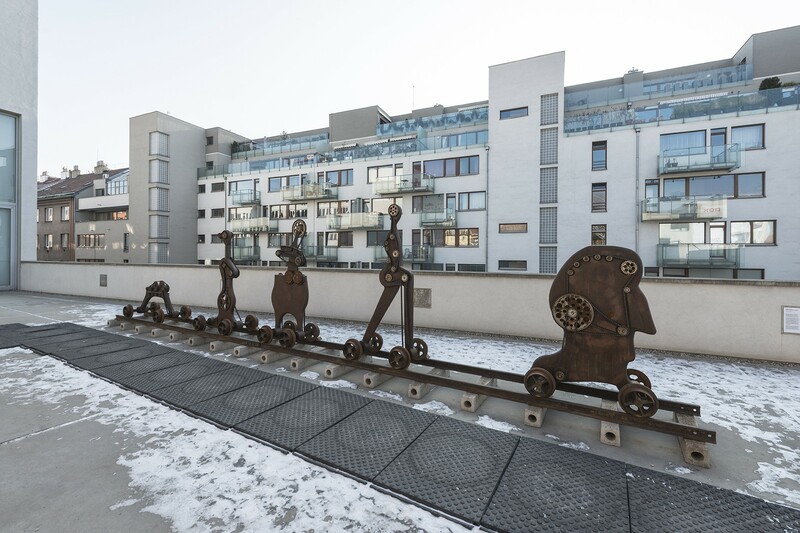 This year, in cooperation with the artist’s family, it will present a reconstruction of the well-known sculptural group Family Prepared for Departure, which Nepraš created after his return from his brief emigration in 1969 within the scope of the Spatial Forms Symposium in Ostrava. The clear political subtext contained in the name of the work and the reference to the topic of emigration from a country occupied by Warsaw Pact troops resulted, despite petitions to preserve the results of the symposium, in the sculpture falling victim to Normalization hysteria and was destroyed. For Karel Nepraš, political developments in Czechoslovakia following 1968 meant dramatic restrictions in terms of exhibition opportunities, participation in the international art world, and the ability to develop his work. Karel Nepraš had fervently hoped that the sculpture could be re-created, and after years of effort, his family succeeded. It was reconstructed during the years 2011 to 2015. It is a second casting made according to the original drawings and 1:1 wooden models.